It’s always good to have a go-to biscuit that is straightforward and not too time consuming to make, but also has an added complexity in taste that makes it stand out from the crowd. This shortbread biscuit ticks all those boxes with flying colours. 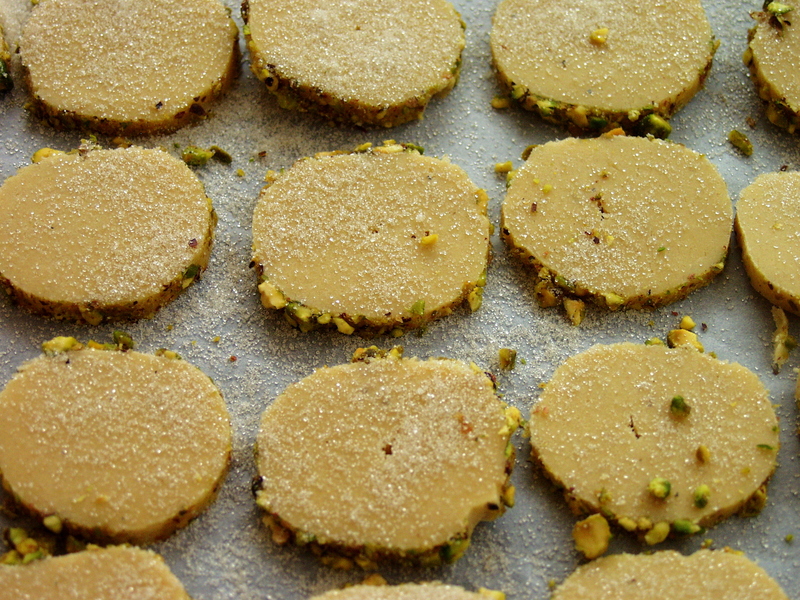 The flavours of cardamom and pistachio sing to me and the partnership is one to be jubilant about. I find it’s great to make a batch and freeze (before cooking) some of the dough, wrapped in cling film, that you are not needing, until you want to make another batch at a later date. At this stage simply remove from the freezer and let it defrost before making incisions into the dough to make your biscuits. With the festive season almost upon us, I also find that they are a great offering to give to friends that you are visiting either wrapped in brown baking parchment, tied with some vintage twine or red ribbon, or placed in a sealed jar. Either way, the effort and initiative will definitely bring a smile upon the receiver. 1. Crush the cardamom pods, using a pestle and mortar and once the seeds have been released remove the skins and then crush the seeds into a fine powder. The smell is sensational. 3. Using your hands roll the dough into a log shape. If you want really large round biscuits then keep the the log short in length, however, if you would prefer small or medium sized biscuits then elongate the dough further. There is no hard and fast rule on how large the biscuits need to be. Wrap in cling film and place in the fridge for over an hour. 4. Meanwhile, place the pistachio nuts into the electric mixer and give them a quick wizz so that they are broken up slightly. If you do it for too long they will become too fine! 5. 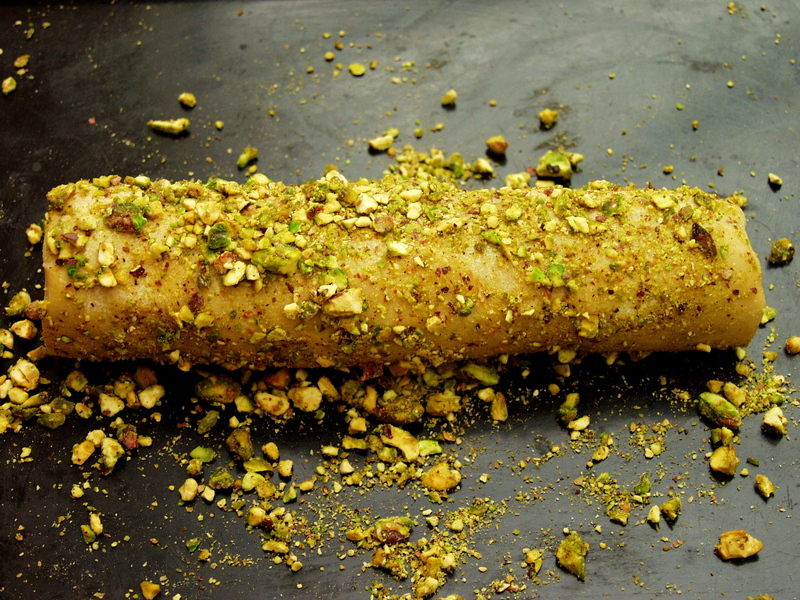 Place the crushed pistachio nuts on a flat surface and take the cling film off the dough (and place the cling film to one side) and brush the log with the beaten egg. Now roll the dough over the top of the pistachio nuts; you may need to give a helping hand and place a few pistachio nuts into the side of the dough. 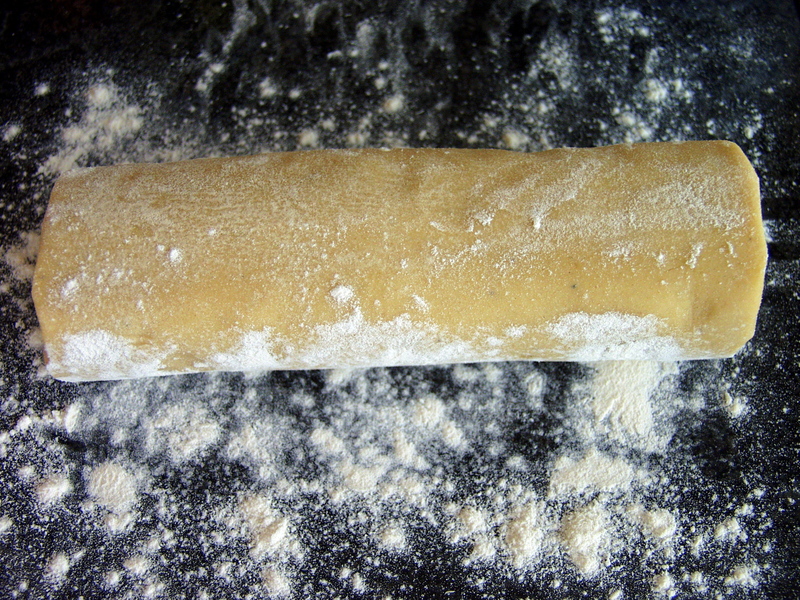 Put the same cling film back on the dough log and place back into the fridge for a further 30 minutes. 6. Preheat the oven to 150 degrees. Remove the cling film and using a sharp knife cut the dough log into even slices and place them on a baking tray lined with baking parchment, placing them 2cm apart. Dust the biscuits with vanilla sugar and place in the oven for around 20 minutes so that they are golden, but not bronzed. Keep a close eye on them. 7. Remove from the oven and allow to cool completely as they will harden as they cool. If you pick them up before they are cool they may well crumble. Once they have cooled store in a sealed jar or container for up to a week. Place the biscuits slightly further apart (2cm) than I have done above or they will begin to join together. This entry was posted in Biscuits, Vegetarian and tagged cardamom pods, cardamom seeds, ground rice, nuts, ottolenghi the cookbook, pistachio, plain flour, vanilla sugar. Bookmark the permalink. These sound great. I will have a go at these when I get the chance. Thanks. 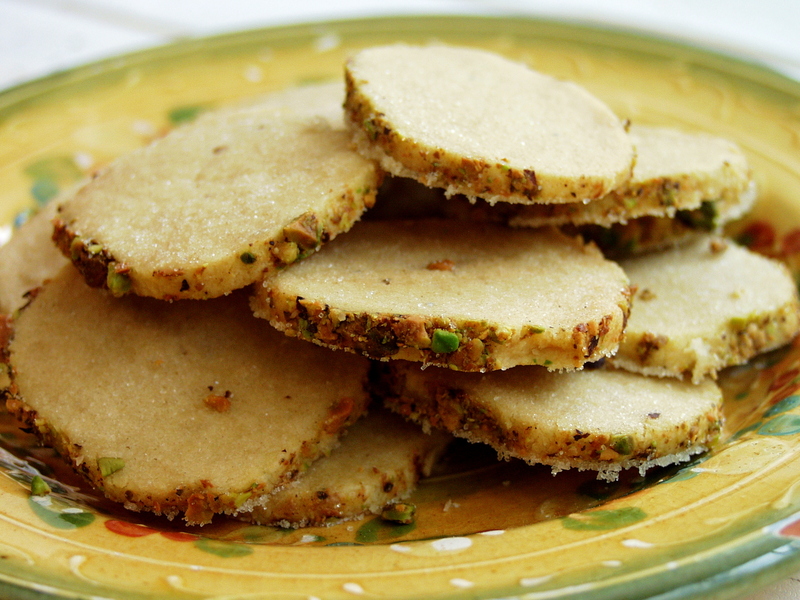 I like the combination of cardamom and pistachios. I usually have these mixtures of tastes when eating authentic Middle Eastern baklava which has a different flavor than the predominantly sugary taste of Greek baklava. Oh! 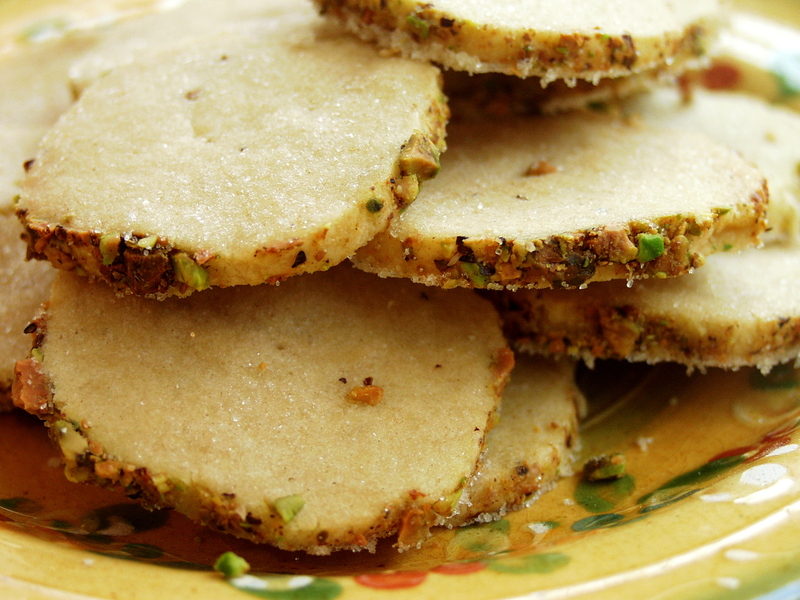 these would make a great holiday gift.. i really really love the edges covered in pistachios.. I hope to try this and thanks for the book tip! The shortbreads are in the oven and I am looking forward to the outcome. The dough tasted delightful ! Funny, I have the Ottolenghi cookbook at home but only got tempted to try the recipe when I found it on your blog. Just found you from the Red Mag link (we’re on there too!) and already want to make at least 10 of your recipes!